In light of today’s protests, Footballers Direct writers are wondering how changing ticket prices are going to impact on match attendance. Will fans always find a way to watch their heroes play at stadiums, or have things been taken too far this time? Some feel that the rising costs could force fans to change the way that they watch football and stick with watching games at the local – others argue that most will find a way to pay the extra due to their love of the game. What do you think? 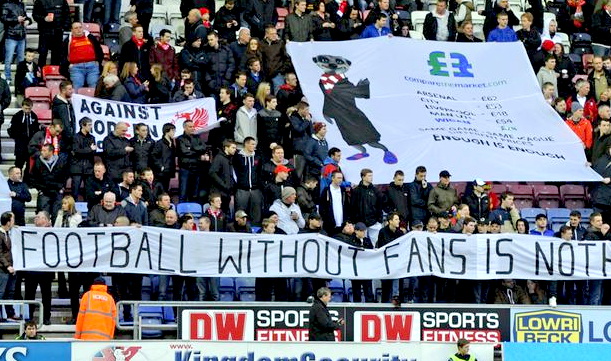 As fans take to the streets today, the Football Supporters’ Federation (FSF) has expressed the view that prices for away tickets should be capped at £20. A spokesperson said: “Nine out of ten fans think football’s too expensive. Along with campaigns like the FSF’s Twenty’s Plenty for Away Tickets, this protest will demonstrate that fans can’t be squeezed forever. Supporters Direct released a statement backing demonstrators this morning. It read: “Supporters Direct supports the demonstration organised today by Spirit of Shankly, one of its member supporters’ trusts. We have been kept abreast of developments, and support their right to protest, and their view that ticket prices and the overall experience for the present-day football fan are issues that cannot simply be dismissed. “Indeed we are keen to ensure that the growing anger, frustration and legitimate disenchantment being expressed through meetings, marches and other events, is harnessed to bring about lasting change in our national game. These actions are driven by a feeling that football is run increasingly for the benefit of a super-wealthy elite, and not the fans – who are the game’s lifeblood. “We continue to press for change in the ownership and governance of football clubs so that the vital role that supporters play in the lives of their clubs is properly recognised. “We call on all those concerned with the health of the sport, to continue to back the Culture, Media and Sport Select Committee, the Government and the opposition in their shared desire to see football reformed, or to introduce legislation to enforce change.